Drawing together literature from a variety of fields, Food Texture and Viscosity, Second Edition, includes a brief history of this area and its basic principles. 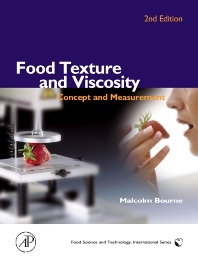 It reviews how texture and viscosity are measured, including the physical interactions between the human body and food, objective methods of texture measurements, the latest advances in texture-measuring instruments, various types of liquid flow, and more. Malcolm Bourne is a nominee for President of the Institute of Food Technologists (IFT) and has earned recognition for his work in industry and academia. He is Editor-in-Chief of the Journal of Texture Studies, and is seen by many as one of the world's leading experts in this field. Cornell University, Food Science and Technology, Geneva, New York, U.S.A.